Brake inspections or repair, we strive never to stop short of excellent service. 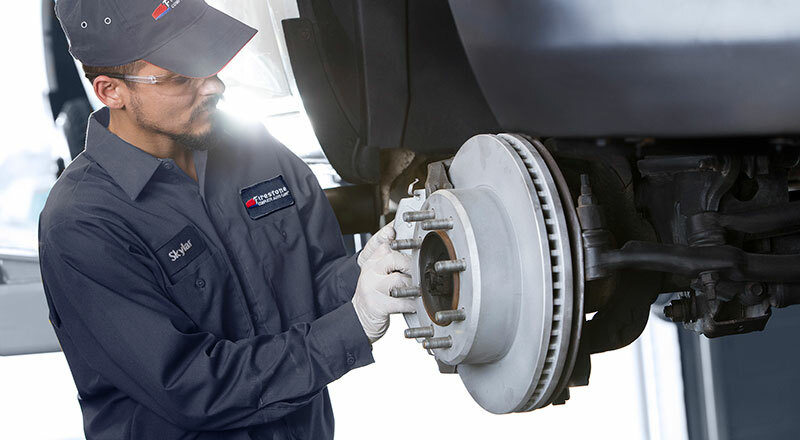 Visit Firestone Complete Auto Care near you for the right brake service in Mountain View. Do squeaky brakes, a spongy brake pedal, or less stopping power have you in desperate need of Mountain View brake specialists? Firestone Complete Auto Care is where you want to go to get brakes for less than other shops. And with our brake coupons, you don't have to spend a fortune on the brake repairs you need to drive safe from morning to night. Can you tell when it's time to stop by? Listen and look for clues. Smells, sounds, and sensations in your steering wheel can all mean you've got braking problems. Eardrum piercing brake noises can point towards worn pads and shoes. Vibration or pulsation in the pedal or steering wheel when braking are common indicators that your brake pads need inspection. No matter the trouble, your best bet is stop by for a free brake inspection. Otherwise, the damage could spread! Visit your closest Firestone Complete Auto Care for a free brake inspection in Mountain View, at a time that works for your busy schedule. You can expect that our technicians will evaluate pad, rotor, and drum wear, along with the health of your emergency brake and brake fluid. We'll then discuss any services with you, like rotor and drum resurfacing, brake pad replacement, brake fluid flush, or brake line replacement. Whether you need new pads or hoses, you’ll find that we’re the best choice for brakes on a budget. Each year our technicians perform close to a million brake repairs! Neglecting brake repairs is a one-way route to risk. Schedule an appointment at your local Firestone Complete Auto Care for brake services in Mountain View at the first brake squeak or spongy pedal. Many of our locations have extended evening hours and are open on the weekends to make repairs more convenient. Drive with confidence knowing that because we did our job, your brakes are ready to do theirs. Visit us today! From oil changes to engine tune-ups to headlight replacements, trust your nearest Firestone Complete Auto Care for your automotive service needs. We're your go-to tire store, service center, and repair shop. Our professional technicians care about keeping your vehicle running newer, longer. When you need work done on your car or truck, we promise quality service at an affordable price. Explore our services and at your convenience, schedule your next courtesy check or repair in Mountain View, Colorado today.